Please be reminded that Saturday 21st April is Record Store Day 2018 (RSD2018) and that there will be two (2) releases of special interest to fans and followers in the UK and Europe of all things The Move and Trevor Burton. Be on the look out for The Move's "In Europe '66-'67" (1960's Records #RANDB022LP) in magnificent mono and Trevor's debut solo album "Long Play" (Gray Sky Records #20) in blood red vinyl and/or cassette. 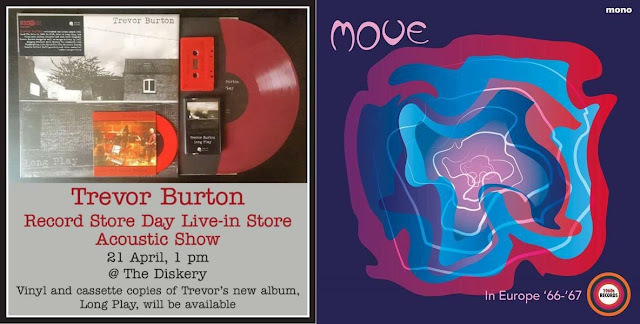 elobeatlesforever (elobf) recommends "Long Play" by Trevor Burton and "In Europe '66-'67" by The Move to those enlightened folks who enjoy the music of ELO, Jeff Lynne, Roy Wood, The Move, The Idle Race, 'Brum Beat', The Beatles and related artistes.